Digital Journal has relaunched their citizen journalism site with a range of new features. 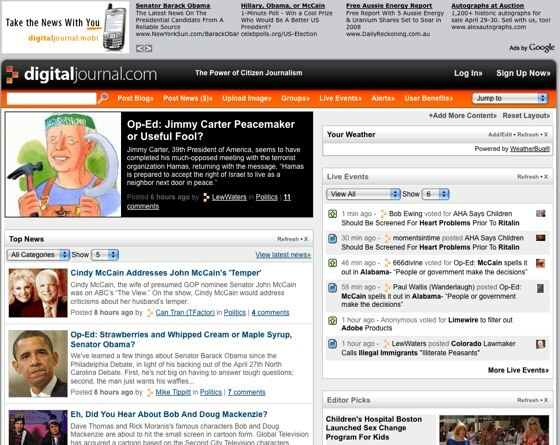 Digital Journal offers a Citizen Journalism site in a similar fashion to Instablogs, OhMyNews, Newsvine, Norg Media and others. Members contribute news items for the site, and in theory the wisdom of the crowd combines to create a Google friendly news resource. Where Digital Journal perhaps is a little different in this space is that it revenue shares with contributors, and has paid out $38,000 to CitJ’s already (note I said in this space, the model has been used by blog networks for years, and the line between this and blogging is pretty thin). DigitalJournal comScore numbers aren’t encouraging (50,000 page views in March), but I don’t hate it, it’s just that its yet another CitJ site. Instablogs took $3 million in March so there’s interest (and money) in this space still, so DigitalJournal may be well positioned going forward; besides: getting paid anything in the land of expecting your users to build your Web 2.0 fortune for free is always a positive.